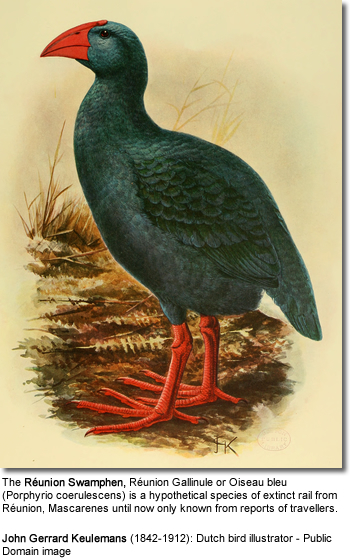 The Réunion Swamphen, Réunion Gallinule or Oiseau bleu (Porphyrio coerulescens) is a hypothetical species of extinct rail from Réunion, Mascarenes until now only known from reports of travellers. It is quite certain that such a bird once was present on the island. 6 reports attest to its existence, and the genus Porphyrio is known as a colonizer of oceanic islands, having evolved into many local endemic species, of which only the Takahē is still found to be extant nowadays. Many later authors assume that this bird was flightless, but the 1674 statement of Dubois is best understood thus that they were unwilling rather than incapable of using flight as a means of escape; also, Dubois' report is confusing in some other ways, suggesting that he mixed up some reports on the "Solitaire" with those of the oiseau bleu. At any rate, the bird was a bit larger than a chicken, or between a Purple Swamphen and a takahē in size, and of entirely dull blue coloration, with a red beak and feet. The bird is attested to have exclusively occurred on the Plaine des Cafres, the high plateau of Réunion between the Piton des Neiges and the Piton de la Fournaise, from 1700 on at least (Dubois gives no locality information, but all other authors restrict the bird to the plateau). it is generally assumed that the Réunion Swamphen was extinct by 1730. As the area where it occurred was not yet being cleared for cultivation, introduced predators and hunting by escaped slaves who took to the mountains are obviously the reasons for its disappearance.